There are 9 Assisted Living Facilities in the Middletown area, with 3 in Middletown and 6 nearby. The average cost of assisted living in Middletown is $3,016 per month. This is lower than the national median of $3,346. To help you with your search, browse the 42 reviews below for assisted living facilities in Middletown. On average, consumers rate assisted living in Middletown 4.2 out of 5 stars. Better rated regions include Port Jervis with an average rating of 5.0 out of 5 stars. Caring.com has helped 6 families in Middletown find high-quality senior care. To speak with one of our Family Advisors about assisted living options and costs in Middletown, call (855) 863-8283. Located at the mouth of the Hudson River, Middletown is a city of approximately 27,000 people. About one out of every five individuals is age 55+. There are 33 assisted living facilities (ALFs) in or near Middletown. Most are in the nearby communities, such as Port Jervis, Goshen and Tuxedo Park, with a few in New Jersey. The New York Department of Health and the New Jersey Department of Health and Senior Services regulate area assisted living facilities. Middletown has an overall Sperling Comfort Index of 40 out of 100. While temperatures reach 83 degrees Fahrenheit in summer, they can dip to 18 degrees Fahrenheit in winter. The city also gets more snow than the national average (45 inches per year versus 26). Seniors can expect about 194 sunny days annually, just under the national yearly average of 205 sunny days. Air quality is just a little lower in Middletown than the national average (54 out of 100 versus 58), according to the National Air Toxics Assessment. But with a rank of 58.3, it beats out both the metro (43.4) and state (47.8) averages in regard to the risk of getting respiratory diseases, which often are often a concern for seniors. Cost of living in Middletown, New York is comparable to the rest of the country (101.8 versus 100). Utilities are highest at 130, with most other expenses exceeding both state and national averages. The area putting money back in seniors’ pockets is housing. The national averages for violent and property crime are 31.1 and 38.1, respectively. Middletown exceeds both these rates, ranking 49.7 for violent crime and 50.9 for property crime. ALFs that can offer better physical and asset protections might prove to be the best choice for seniors looking to live in the area. Middletown does have a Neighborhood Watch. Seniors can get out into the Middletown community through the city’s door-to-door Senior Shuttle Bus Program that operates six days a week. It is available to residents 60 years of age or older. Middletown is home to world-class medical facilities, including Orange Regional Medical Center and Crystal Run Healthcare Middletown, in the event of medical emergencies or illness. Assisted Living costs in Middletown start around $3,016 per month on average, while the nationwide average cost of assisted living is $4,000 per month, according to the latest figures from Genworth’s Cost of Care Survey. Seniors in Middletown, New York can reduce their financial load while receiving ALF services through governmental options such as the Assisted Living Program and Long-Term Home Health Program 1915(c) Waiver program. For facilities near Middletown in New Jersey, there is the 1115 Demonstration Waiver program. 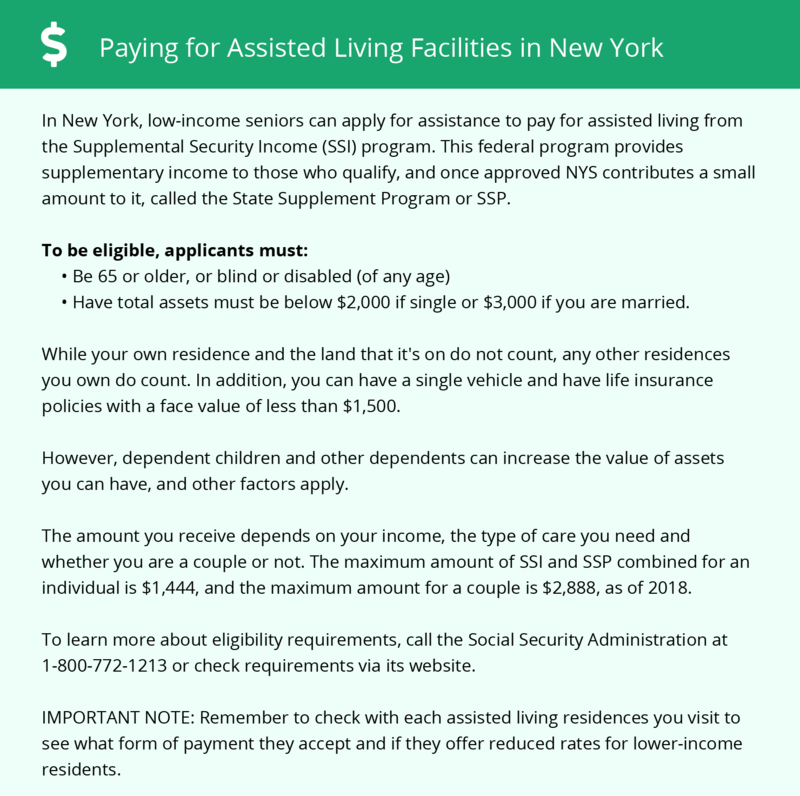 Both New York and New Jersey offer state supplements for SSI recipients, as well. To see a list of free assisted living resources in Middletown, please visit our Assisted Living in New York page. Middletown-area assisted living communities must adhere to the comprehensive set of state laws and regulations that all assisted living communities in New York are required to follow. Visit our Assisted Living in New York page for more information about these laws.